Only Builder rank players may build here! Custom-generated map - large continents and massive oceans. Map upgraded to 25k as of 1.2.5 update! Auto-generating world map with coordinates and locations on! This world is all about beautiful buildings and architecture with nothing to stop their creation. It is a 'model world' - somewhere where everything is awesome, right down to the transport systems themselves. Because of this, only Builder rank players may build in this world. This is not to try and make a group of 'Elitist' players - it is to ensure it is full of high quality buildings and eliminate the problem of griefers. Because of the whole idea this world is to have no limitations, item giving is enabled as well as some other unique tools. Some of you may be confused right now - our ethos has always been about building in a legit manner as Notch intended. In our view the Creative world is still as Notch intended - it is just like the creative mode in Minecraft with a few extra utilities. Please note that just because we have enabled item giving on this world does NOT mean we will give it to any other world. There is no point asking - it will not happen. The world itself was custom generated using a special Biome Terrain Mod. The settings were tweaked to create deeper oceans and larger continents. The world was then pre-generated to 5000x5000 in size. 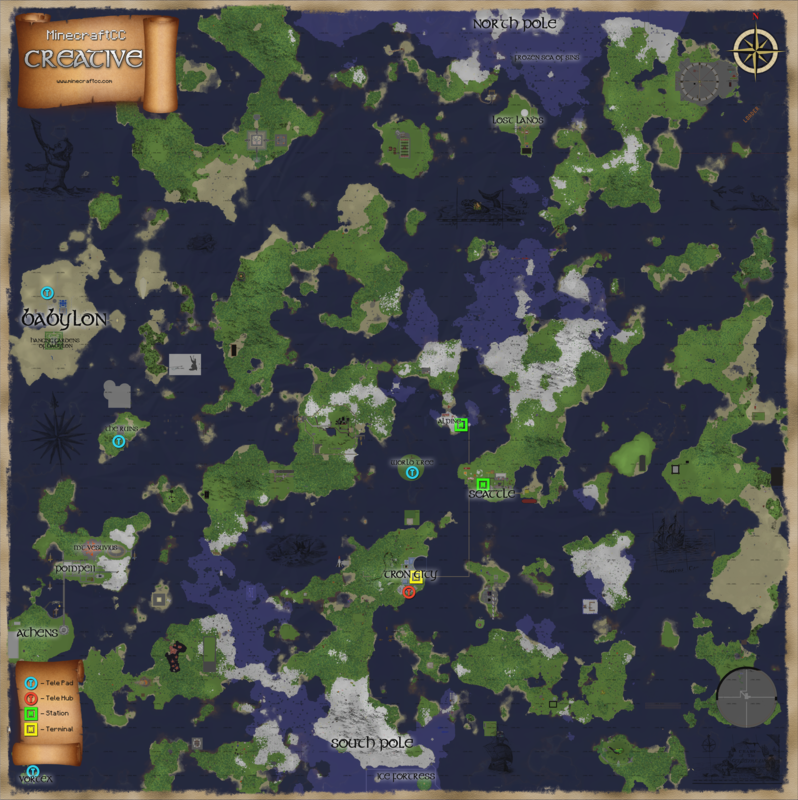 Coffeejunky and oliverw92 then spent several days terraforming the map - cleaning the edges of the world, removing excess islands and land, creating new sand and snow biomes. The result is a real world-like map that is perfect for building incredible cities and structures. The creative world is all about 'building together'. It is a collaborative project where everyone has a say in everything. Building together in towns and groups will always be more fun and end up with more attractive results - two heads always produce better ideas than one! It is still ok to build on your own, but make sure that it is still fitting into its surroundings and does not interfere with any areas that cities might expand into. Whilst we are promoting the idea of 'building together', we also support the idea of 'controlled cities'. If you start a city, you own all the land it encompasses. If you don't want people to build in your city, that is fine. They have to respect that. It is the same as any other world - you own what you build, and nobody has a right to take it down unless you build it on their land. At first Creative might seem like the perfect place to build '8bit' pictures (2D images using wool etc). Creative is NOT a place to make these. Apart from taking up a lot of vertical room, they are relatively easy to make (you are copying pixels off an image) and are much less complicated and intricate than proper 3D architecture. There is a dedicated area in Build for 8bit images - please use that area. If Creative was larger then maybe there would be a dedicated area for 8bits, but seeing as there is limited room on the map at the moment 8bits will not be allowed in the foreseeable future. Coffeejunky has created a custom texture pack for our creative world. All Builders are required to use this texture pack when building in Creative. This is to make sure we all see the same thing when building. You can find out more on the Texture Packs page. Terraforming is the process of transforming landscape with extra tools. These tools are too dangerous to give to anyone except select moderators who have been trained to use them. Terraforming is often essential for large projects, however, so these moderators are willing to help anyone who needs basic land forming done (removing a mountain, creating more snow areas etc). Do not ask for ridiculous things - keep it simple. Remember it is their time you are taking up.